Acting in classical endocrine fashion, oxytocin elicits regulatory effects by binding to only one known specific cell surface type of receptors. This binding initiates a secondary intracelluar response cascade via a Phosphoinositide signaling pathway. A recent paper suggests that experiences of childhood emotional maltreatment may alter salivary Oxytocin levels, which in turn are related to more positive perceptions of infant stimuli with positive emotions (8). Use of the oxytocin kit from Arbor Assays, Inc. (Cat. nr 183K048-C1), in gorilla saliva samples. Newly developed Oxytocin assays break the 10 pg/mL barrier, offering reproducible, reliable, affordable and consistent detection of human Oxytocin. They are designed to quantitatively measure Oxytocin present in serum, plasma, clarified milk, and tissue culture media samples. 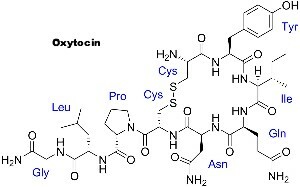 An Oxytocin standard is provided to generate a standard curve for the assays. The assay uses an antibody that also recognises Mesotocin and Isotocin. Arbor Assays, Inc., as a supporter and exclusive supplier to the International Society for Wildlife Endocrinology, has now introduced the peptides Mesotocin and Isotocin as stand-alone products to be used as a standard for those researchers studying birds, reptiles, amphibians, coelacanths and fish. Looking for Oxytocin, Mesotocin and Isotocin asssays? G.L. Kovacs, & D.H.K. Versteeg, “Neurohypophysial Peptides and Brain Neurochemistry.” 1993, Ann. NY Acad. Sci., 689:7 309-319. Insel TR, Young L, and Wang Z, “Central oxytocin and reproductive behaviours.” Rev. Reprod., 1997, 2(1): 28-37. A. Frasch, et al., “Oxytocin: Cellular and Molecular Approaches”, 1995, NY: Plenum Press. M.M. McCarthy, & M. Altemus, “Central nervous system actions of oxytocin and modulation of behavior in humans. “, Mol. Med.Today, 1997, 3(6): 269-275. A. Argiolas, & M.R. Melis, “Oxytocin: Cellular and Molecular Approaches”, 1995, NY: Plenum Press. K.P. Conrad, et al., “Influence of oxytocin on renal hemodynamics and sodium excretion.”, Ann. NY Acad. Sci., 1993, 689: 346-362. R. Archer, & J. Chauvet, “The neurohypophysial endocrine regulatory cascade: precursors, mediators, receptors, and effectors.”, Front. Neuroendo., 1995, 16: 237-289. R. Bhandari et al., “Salivary oxytocin mediates the association between emotional maltreatment and responses to emotional infant faces”, Physiol. & Behavior, 2014, 131:123–128.